Have you ever watched other people taking on adventures in Africa with their 4 x 4 vehicles? If you have, you know how harsh certain terrains can be. You sometimes wonder how they can achieve this with their Jeep or more. There is one crucial feature on those Trucks or SUVs that makes cruising possible the MUD ATV tires. With the all-terrain vehicle tire, you can use your van on different surfaces from concrete to dirt roads. Perhaps you are in the agricultural business or enjoy taking on your adventures. 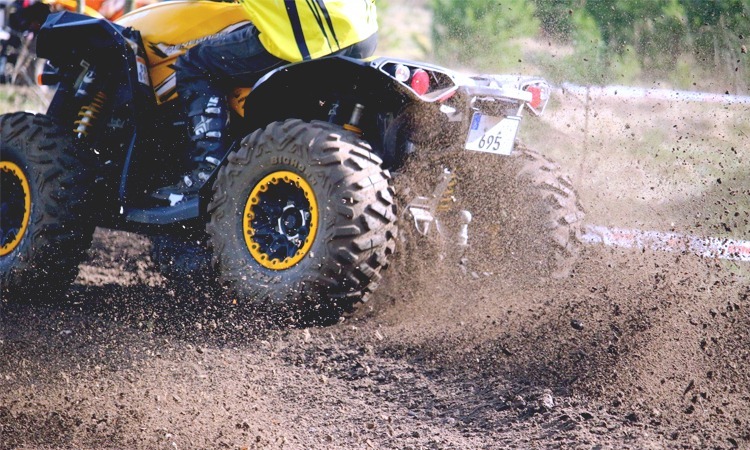 With your Truck outfitted with the ATV tire, it will help to ease driving as it has a low-pressure. You can buy the tires in two different styles for off-road and sports vehicles. If you are in the market to buy the best MUD ATV tires, we have selected the best brands for you to purchase here. For all-terrain, driving Maxxis has designed the best MUD ATV tire. The tire is for the front of the vehicle and has a 26-10.00-12 size. With the tread pattern, you get outstanding traction when driving in mud. The tread bar height is 30mm and has a six-ply rating. The ply prevents punctures from taking place, and it has a reinforced carcass ridge. To add strength to the tread lug, it has a dual stage lug, and the angled tread bars remove mud from the tread. Are you geared up to take on, the mountain roads make sure to get you a set of these tires? Are you ready to hit the toughest terrain, make sure to equip your vehicle with the ITP Mega Mayhem MUD ATV tire? You will cruise through mud and over stones as the casing has a high-performance design. The tread has a 1.5-inch depth and has a six-ply coating. To add extra durability, it has a rubber compound structure to protect it from wear and tear. The benefit is that these all-terrain vehicle tires move from flat to hard surfaces in no time. 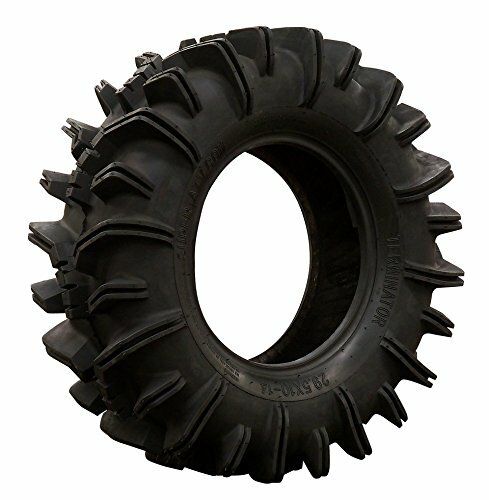 The MUD tire you can buy in various sizes to use on your van. 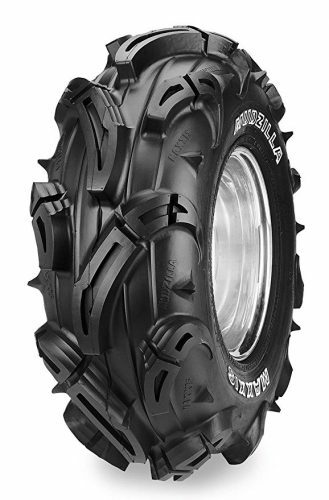 Never leave home without the Mudzilla ATV tire from Maxxis. With these tires, you can ride through mud and snow. You can place these tires on the front or rear of the vehicle. The size of the product is 27-9.00-12 and has a 6-ply design. You must agree the design looks aggressive. For traveling from flat to rough surfaces, the tire has a pyramid tread block with extra extended biting lugs. The tread bars are massive and makes riding through the mud a breeze. The tire even has rim guard to protect the wheel. Do you need an aggressive mud tire? You need the Quadboss all-terrain vehicle tires to get you out of tight spots. To protect the wheels the casing has an included rim bar with a directional tread to give the best traction. You can buy the product in different sizes to fit in the front and rear of your ride. 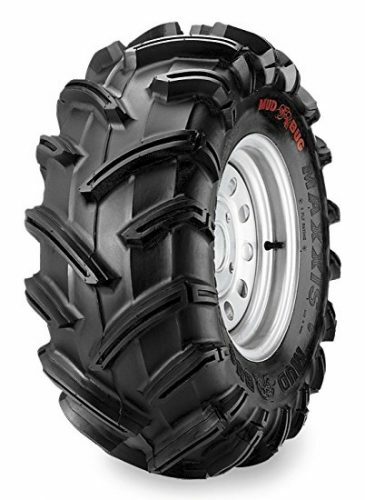 The load capacity is 1200 lbs and is one of the best all-terrain vehicle tires available. The tread depth is up to two inches. When making your purchase you receive two tires with a robust six-ply rating. 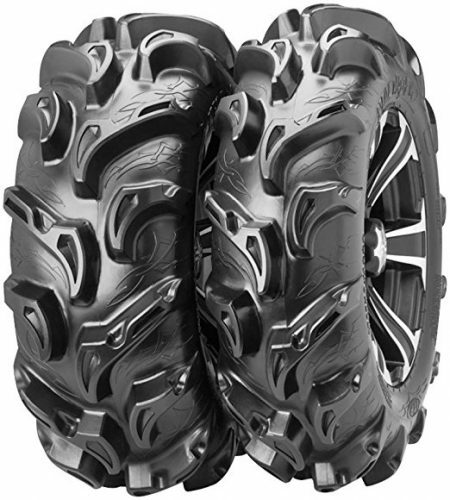 The following MUD ATV tires from ITP Monster Mayhem have a 30-inch sizing. Fit it on your 4X4 or UTV and take the open rough terrains without any worries of being stuck. The lug depth of 1.74-inches is brutal and looks beastly. The 6-ply rating offers you a durable design that does not puncture easily. For endurance, it has a rubber compound and gives you the power needed when traveling on rough terrains. 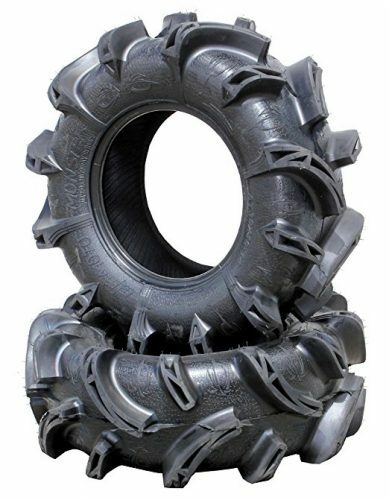 As the name implies, this Terminator MUD-ATV tires can handle from flat roads to deep sludge. The features tires here have a 29.5×10-14 size with excellent grip. The tread depth is 2-inches, and it has an included rim guard protecting the wheels. The tread is tapered and self-cleaning to remove muck while you are driving. With the 6-ply rating, it has a massive load capacity and a durable design. The tires are one of the most aggressive all-terrain tires you can buy. 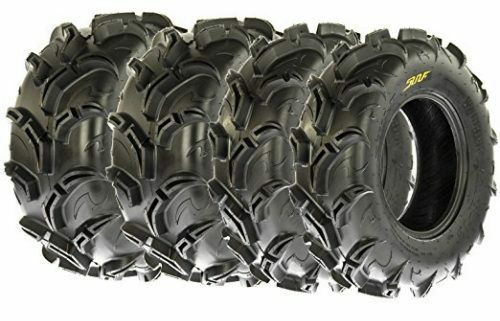 For right swamp tires, nothing comes close to the Monster Extreme MUD ATV Tires. The tires are self-cleaning and get you out of dirt pits with ease. Each lug inside the tread pattern has a 2-inch depth. The unique side paddle lugs flow into the wheel protector and help keep the wheels in tip-top shape. Through the design is a reptile theme with fierce looking eyes that look forward. Take your adventure to the next level when taking on muddy terrains or even flat roads with these tires. You can be sure if you do get stuck it was not the tires fault. 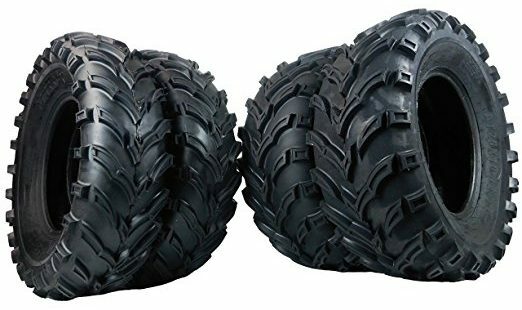 For a set of four MUD ATV tires at an inexpensive price, you can look at the Claw from MASSFX MS. You get the best braking control with the newly designed lugs that have a ½ -inch depth. The construction of the tires durable with the 6-ply rating and has a new tread pattern for acceleration and grip. 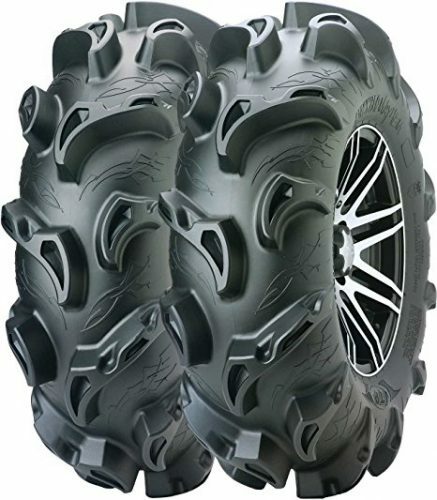 You can ride from rough terrains to smooth surfaces easily with this all-terrain vehicle tire. You receive two 25 x 8 x 12 front and two 25 x 10 x 12 rear tires with your purchase. Another fantastic four MUD ATV tire set is the Sun.F brand. You receive two front 26×9-12 tires and two rear 26×11-12 tires. The V-angled knobby treads are different compared to other brands and work well on all terrains. You can buy the set in different sizes to use with your lawnmower, SUV, automobile and more. The treads self-cleaning and have sturdy shoulder knobs to protect the rim & sidewall. Included you receive a one-year warranty. For the best all-terrain vehicle tires for different terrains, you need the Interco Swamp. 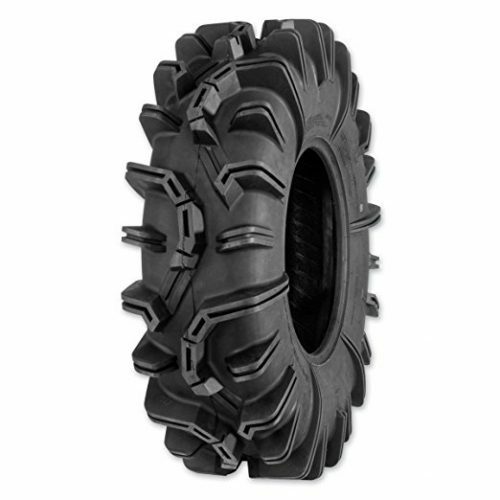 The ATV tires offer you the best off-road performance as it has a six-ply rating. You can travel through sludge, snow, and more. You can buy the Swamp in a set of four tires. The collection consists of two front/rear ones with the following sizes 25 x 8-12 and 25 x 10-12. The casing has a lightweight and travels over different surfaces easily. The tread is self-cleaning, and the tire looks and works aggressively. If you are an outdoor enthusiast, you need the smoothest ride. Make this possible with one of the top 10 MUD ATV Tires in 2019 here. Crossover difficult terrains with any of these set of wheels. You can buy The tires individually or in a set of four at affordable prices. So if you need a terrifying beast to make your off-road riding, a pleasure pick a set and enjoy your adventure.